On November 18, 2018, the Guardian reported on the reception that the Central American caravan has received in Tijuana, Mexico. Oddly enough for those who do not follow the subject, that reception has not been warm. To be fair to the Times, that article did note that another caravan of 250 Salvadorans further south had been stopped by Mexican Federal Police and immigration officials and sent to a migration detention center. Similarly, however, the Guardian headline also conveys the tenor of that piece: "'Out! Out! ': protests grow in Tijuana against migrant caravan". That article notes that hundreds of residents of Tijuana have turned out to protest the 3,000 members of the caravan who have entered that city in the past few days. According to that article, the Mexican government estimates that as many as 10,000 individuals from the caravan may soon be camped out in that city. Asylum seekers register their names in a tattered notebook managed by migrants themselves that had more than 3,000 names even before the caravan arrived. The Guardian described the protest in Tijuana in some detail, stating that the hundreds of protesters waved Mexican flags and sang the national anthem while chanting "Out! Out!" Channeling Donald Trump, the protesters were complaining that the caravan had forced its way into Mexico, and called it "an invasion." Those protesters also worried about the cost to the municipality of 1.6 million of caring for the group. 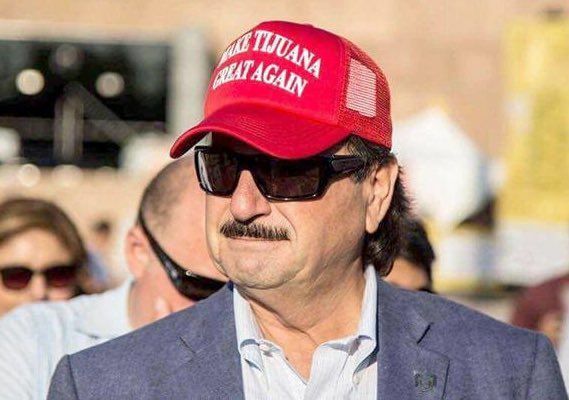 The mayor of Tijuana even sported a red "Make Tijuana Great Again" cap. Respectfully, the response of the citizens of Tijuana, in comparison to the response elsewhere in Mexico, makes a certain amount of sense, although the use of violence is unacceptable. It is one thing to support travelers as they make their way through an area; it is something altogether different when the citizens of a specific city must deal with the indefinite stay of a group of individuals who have no right to be in the country to begin with. In any event, it is not entirely clear how it is that the members of the caravan ended up in Tijuana to begin with. The quickest route for the caravan would have led it to Matamoros, Mexico, as CNN reported in late October. The network stated that the "safest" route for the group would have taken it through Mexico to Tijuana, rather than to Matamoros, but I would question, given the amount of press attention that has been paid to the caravan (and the Mexican government's interest in the safety of the members of the caravan) whether there would have been any actual peril had the group taken the most direct route. Perhaps another reason for the choice of port of entry is the fact that Tijuana sits across (roughly) from San Diego, home of the United States District Court for the Southern District of California, which falls under the jurisdiction of the Court of Appeals for the Ninth Circuit. It is beyond cavil that this is a much more liberal circuit court than the Court of Appeals for the Fifth Circuit, which has jurisdiction over the United States District Court for the Southern District of Texas, Brownsville Division, which sits across from Matamoros. If CBP is processing only 100 aliens per day, and there are potentially 10,000 aliens seeking to enter the port of entry to make credible fear claims, it would take upwards of 100 days to process them all. It remains to be seen whether those potential applicants will patiently wait in an area where they are unwelcome, or will seek illegal entry elsewhere.